Prevention and early intervention are the most cost-effective means of dealing with potential, new and emerging weeds in Queensland. The Weed Spotters Network Queensland aims to find, identify and document those new occurrences of potential weeds at an early stage so that preventative actions can be taken. It seeks to continue a community-based weed alert system in Queensland, based on the model developed by the previous Cooperative Research Centre for Australian Weed Management. The cost of weeds to Australian agriculture now exceeds $4 billion per year. No estimate has been made of the cost of weeds to the environment. 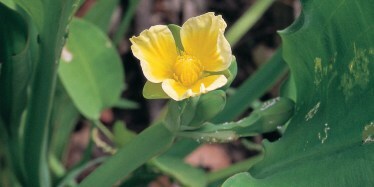 You can help detect weeds by sending specimens for identification. Complete an application form to register for the Weed Spotters Queensland Network. Weed spotters receive a weed spotters bulletin each month with information on current and emerging weeds and weed spotter activities along with a list of regional contacts. Weed spotter resources are available to assist weed spotters and coordinators with weed identification. Limnocharis flava (Limnocharis) is a restricted invasive species in Queensland. Weed spotters report, collect, identify and deliver specimens of potential, new and emerging weeds in their region. They can be landholders, gardeners or members of community groups such as Landcare, Bushcare, Society for Growing Australian Plants, along with Australian, state and local government officers, industry representatives, and anyone else interested in weeds and plants. Regional coordinators help identify and filter weed spotters' specimens and pass them onto the Queensland Herbarium. They also provide feedback to weed spotters in that region about new and emerging weeds found, and help with training, resources, and accessing government information. The Weed Spotter Project Officer coordinates the network across Queensland, provides training and raises awareness of weed issues through a monthly newsletter, media releases, website and publications. Pueraria montana var. 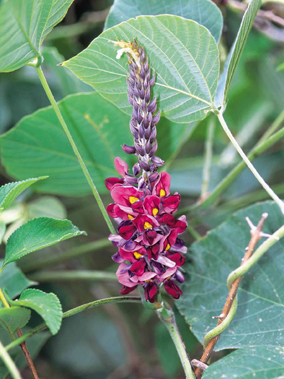 lobata (kudzu) is a restricted invasive species in Queensland. The Queensland Herbarium (part of the Department of Environment and Science) identifies and verifies weed specimens, incorporates some of them into their specimen collection, and enters the label information into databases (HERBRECS and Wildnet). The Herbarium also notifies Biosecurity Queensland, and other government officers in the region, of any new naturalisations or new occurrences of declared weeds and any potential new and emerging weed species. Biosecurity Queensland (part of the Department of Agriculture and Fisheries) provides leadership and support for management of invasive plants and animals in Queensland. They develop policy, legislation, pest risk assessments, research, state-wide coordination of pest programs, and communication and education awareness programs. Local councils work in partnership with other agencies to implement Local government biosecurity plans, and provide information on weeds in their local area. Landholders in Queensland have a responsibility to manage declared weeds on their properties, and are encouraged to be on the lookout for new weeds.